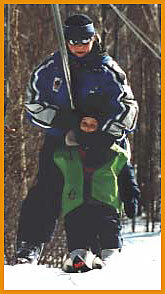 Kidznsnow Article: From the Eastern Front - Quebec! Bonjour mes amis! Comment ca va? Nous avons jusqua retourné a faire du ski a Quebec, and il [was] magnifique! Well, maybe the high school French is a bit rusty, but the intent is obvious - we’ve just returned from skiing in eastern Quebec and it was magnificent! You’ve heard of “lake effect” snow that upstate New York gets from the Great Lakes? Well, how about the “river effect” snow that Mont Ste. Anne and Le Massif receive thanks to their location on the shores of the St. Lawrence River. Now, before you dismiss that as hyperbole, remember this: in that area, the river is nearly twelve miles wide. That’s a lot of water and it helps to generate considerable amounts of snow. Le Massif sits directly on the river. On some runs, given the steep but consistent pitch, you feel like you’re actually going to ski right into the frigid water. As a result, the skiing yields views that are truly unique - with a twisting shoreline disappearing to the east, ice flows making their way up or down river (it’s a tidal river, still affected by the Atlantic Ocean), and sometimes wonderfully eerie cloud formations drifting around below you. Just ten years ago the only uphill transportation at Le Massif was by school bus. Now there’s a top-to-bottom high speed quad that makes accessing the slopes extremely efficient. Still, out favorite section is off the “other” chair, a double that served a handful of black diamonds and one nifty trail that travels “sous bois” - under the trees. And, come next season, a major expansion will further improve things. Mont Ste. 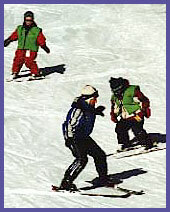 Anne is sometimes cast as the “other” ski area in Quebec, because many folks think first of Mont Tremblant, north of Montreal. But, Mont Ste. Anne is a big hill, and one that loves kids. (Take a week here and your kids just may be speaking French by the time they go home.) They’ve even got a green-rated glades trail called La Vital Roy that was cut particularly with kids in mind. (We confess to sneaking in there unaccompanied by kids and having a very good time.) During our recent visit, however, the highlight was six inches of new snow - kept western-fluffy by prevailing cold temperatures - that provided a classic eastern powder day. We scurried all over the mountain looking for stashes, and even helped to open two trails, thus getting some fine first tracks. In between, we stopped by the trailside “cabine `a sucre” (“sugar shack”) for some “sugar on snow.” (The secret is to let the hot maple syrup cool for a few minutes before you roll it onto your wooden Popsicle stick.) Delicious. We also spent a few nights at the magnifique Chateau Frontenac in Quebec City, North America’s only walled city. When you toss in the urbane urban element to the continental feeling that eastern Quebec exudes, you’ve got a nifty European adventure without having to cross the ocean. And, all with that fantastic Canadian dollar exchange rate. Nous l’aimerons. We love it.